Context: Welding is pivotal in shipbuilding. The fumes and gases involved in welding may cause respiratory morbidity. Aim: To study the prevalence of respiratory morbidity (RM) among welders vis à vis among nonwelders and its association with certain relevant factors. Settings and Design: A cross-sectional study of 276 welders and 276 nonwelders was conducted in the shipbuilding industry. Materials and Methods: An interviewer-administered questionnaire was followed by spirometric examination. Statistical Analysis: Odds ratio and its 95% CI and two-way ANOVA. Results: Prevalence of RM was found to be significantly higher among welders compared to nonwelders (who were comparable in age, duration of employment (DOE) and smoking habits,) with odds ratio (OR) of 1.78 (95% confidence interval (CI):1.20-2.63). Obstructive type of RM was predominant in both welders (26% (n = 73)) and nonwelders (17% (n = 49)) with welders being at a significantly higher risk (OR = 1.66 (95%: 1.10-2.49)). RM was commoner after the 40 years of age or after 20 years of employment in both groups. Smoking was associated with RM among welders (OR = 1.48, 95% CI: 1.24-1.75) as well as nonwelders (OR = 2.83, 95% CI: 2.26-3.54). Work-related respiratory symptoms (WRRS) was not found to be related to RM (OR = 1.69, 95% CI: 1.00-2.84). Consistent use of personal protective equipment (PPE) was protective against RM in welders (OR = 0.33, 95% CI: 0.28-0.37). Conclusion: Welders had a greater burden of RM and this was related to increasing age, DOE, smoking and inconsistent use of PPE. WRRS were not indicative of RM. Shipbuilding relies heavily on welding as a fusion process to join metal pieces at joint faces rendered plastic by heat, pressure of both. Arc welding (also called shielded metal arc, stick welding ) is the commonest process used; others include metal-inert gas, tungsten-inert gas and submerged arc mainly involving steel, besides also aluminium, galvanised steel, copper and nickel. Welding releases gases and metal fumes, exposure to which may cause respiratory morbidity (RM). However, while some studies describe an association of welding and RM, ,,,,,,,,,, others refute. ,,, This study examines the prevalence of RM among welders compared to non-welders. A cross-sectional study was conducted in 2008-09 involving 276 welders (predominantly engaged in arc welding) and 276 nonwelders working in the shipbuilding industry. All the welders employed in the industry (276) were included while 276 nonwelders were chosen such that they were similar to the welders in terms of age and smoking status. Nonwelders were subjects who were neither involved in nor exposed to welding activity during the course of their work and were comparable to welders in terms of age and socioeconomic status. An interviewer-administered questionnaire was used to record patient details, presence of WRRS (defined as cough, wheeze, chest tightness or shortness of breath any of which reported to be worse at work or improving on rest days  ), history of smoking habits,  relevant past history and PPE (facemask) use. This was followed by spirometric examination by an experienced technician on a regularly calibrated instrument (Schiller Spirovit SP-1) using the standardised procedure prescribed by ATS (1994 update). Spirometry was performed before the workers began their work-shifts and the highest values of forced vital capacity (FVC) and forced expiratory volume in one second (FEV 1 ) were taken from acceptable volume-time and flow-volume curves from three acceptable forced expiratory manoeuvres. Height closest to one centimetre was measured by the standard method and used for calculation of predicted values by means of reference equations for Indians pre-programmed in the machine. RM was identified and classified based on the proportion that the observed values constituted of those predicted. FEV 1 < 80% predicted was classified as obstructive RM, FVC < 80% predicted indicated restrictive RM while mixed RM was defined as FEV 1 < 80% predicted along with FVC < 80% predicted. Inferential statistics used included calculation of OR and its 95% CI and two-way ANOVA, the level of significance for which was taken to be P value of <0.05. Informed consent was obtained from all subjects prior to inclusion in the study. The study protocol was approved by the institutional ethics committee. All subjects were males. The welders were comparable to the nonwelders in terms of age, DOE and smoking habit [Table 1]. The prevalence of RM on spirometry was found to be greater among welders than the nonwelders (OR = 1.78, 95% CI: 1.20-2.63), a difference which was statistically significant. Obstructive type of RM was found to be predominant and welders were at a significantly higher risk of developing it than were the non-welders (OR = 1.66 (95% CI: 1.10-2.49)) [Table 2]. 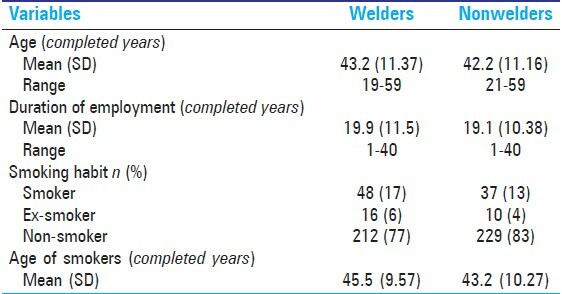 The welders and non-welders with RM did not differ significantly from each other in terms of mean age or DOE. However, a statistically significant difference was detected for age and DOE between subjects of both groups having the enumerated types of RM [Table 3]. WRRS were found to be restricted to the welders with 98 (35%) of them reporting such history. WRRS however, were not found to be significantly associated with RM (OR = 1.69, 95% CI: 1.00-2.84). Smoking was found to be associated with RM among welders (OR = 1.48, 95% CI: 1.24-1.75) as well as nonwelders (OR = 2.83, 95% CI: 2.26-3.54). The ex-smokers, being a small number, were combined with the smokers for the purpose of calculating OR such that this OR comes to represent the odds of RM in ever-smokers compared to non-smokers. Consistent PPE use was found to be protective against RM in welders (OR = 0.33, 95% CI: 0.28-0.37). However, only 164 (59%) welders reported consistent use of PPE that was available liberally at the workplace. Of the 112 inconsistent users, 74 (66%) gave the chief reason that the mask was uncomfortable to wear while the remaining 38 said they perceived no need for its use and felt they managed quite well without it. The relationship between welding and RM has interested investigators since long, perhaps because of the ambiguity plaguing a seemingly simple and biologically plausible hypothesis that the respiratory hazards of welding cause RM among welders by virtue of their occupation. Ten studies reviewed here, ,,,,,,,,,, of which two are of longitudinal design, , one case-control  and the rest cross sectional, report a significant association between welding and RM on spirometry, while four others (one of them longitudinal  ) suggest the opposite. This implies that the aetiology of RM in welders is multifactorial and may vary in different settings. The current study revealed that welders have a higher burden of RM on spirometry in comparison to nonwelders, the predominant being the obstructive type. Association between increasing age and RM have been reported by several authors ,,,, and that between RM and DOE by others , though a case control study by McMillan, et al. did not concur. The present study found that RM is commoner after the fourth decade of life or after 20 years of employment, possibly a cumulative effect in time. While Bradshaw, et al. observed WRRS to be associated with lower values of FEV 1 , other studies examining the respiratory symptoms in welders, though not specifically classified as work-related, have reported conflicting findings. One reported no association  and two others, a statistically significant relationship. , Over-reporting of respiratory symptoms due to awareness of exposure is a possibility while one may also expect some amount of survivor bias to attenuate the number of welders with respiratory symptoms to leave the occupation. Though the present study is of cross-sectional design obviating possibilities to explore temporal relations between exposures and outcomes, the association of RM with occupation as a welder, increasing age and DOE, smoking and inconsistent use of PPE has clearly emerged. These findings have been of use in amending of workplace regulation, screening criteria and worker education material in the said industry. The authors recommend similar studies perhaps with greater logistic support (quantifying fume exposures for instance) in settings involving significant welding activity so that authorities may have access to evidence-based recommendations tailor-made to the actual workplace situation. RM is more prevalent among welders and is related to increasing age, DOE, smoking and inconsistent use of PPE. WRRS are not associated with RM. The authors would like to express heartfelt thanks to all the people who have helped in this study: Dr. Savio De Pinto Souza, Mr. Ulhas T, Mr. Tarun, Mr. Shrirang, Mr. Morais Norton, Mrs. Maria Justina Dias, Mr. Gopinath Naik, Mr. Mark Wilson Gonsalves, Miss. Reema D. Arondekar, Miss. Jennifer Noronha, Miss. Kavita Moodangi, Dr. Jagadish Kakodkar, Dr. Delia De Souza, Dr. Somnath Perni, Dr. Nadia Pinto, Dr. Amit Dias and Dr. Joy Bazroy. 1. Lyndon GS. Welding and thermal cutting. In: Encyclopaedia of Occupational Health and Safety. 3 rd ed. Geneva: ILO; 1983. p. 2290-5. 2. Guidotti TL, Lappi VG, Laggard S: Environmental and Occupational Medicine; Hazards of welding technologies. In: Rom WN, editor. 2 nd ed. London: Little Brown and Company; 1992. p. 831-40. 3. Sjögren B. Effects of gases and particles in welding and soldering. In: Zens C, Dickerson 0, Horvath E, editors. Occupational Medicine. 3 rd ed. St Louis: Mosby Year Book Inc.; 1994. p. 917-25. 4. Fidan F, Unlü M, Köken T, Tetik L, Akgün S, Demirel R, et al. Oxidant Antioxidant Status and Pulmonary Function in Welding Workers. J Occup Health 2005;47:286-92. 5. Jafari AJ, Assari MJ. Respiratory effects from work-related exposure to welding fumes in Hamadan, Iran. Arch Environ Health 2004;59:116-20. 6. Meo SA. Spirometric evaluation of lung function (maximal voluntary ventilation) in welding workers. Saudi Med J 2003;24:656-9. 7. Mastrangelo G, Tartari M, Fedeli U, Fadda E, Saia B. Ascertaining the risk of chronic obstructive pulmonary disease in relation to occupation using a case-control design. Occup Med 2003;53:165-72. 8. Erhabor GE, Fatusi S, Obembe OB. Pulmonary functions in Arc welders in Ile-Ife, Nigeria. East Afr Med J 2001;78:461-4. 9. Bradshaw LM, Fishwick D, Slater T, Pearce N. Chronic bronchitis, work related respiratory symptoms, and pulmonary function in welders in New Zealand. Occup Environ Med 1998;55:150-4. 10. Erkinjuntti-Pekkanen R, Slater T, Cheng S, Fishwick D, Bradshaw L, Kimbell Dunn M, et al. Two year follow up of pulmonary function values among welders in New Zealand. Occup Environ Med 1999;56:328-33. 11. Ozdemir O, Numanoglu N, Gonullu U, Savas I, Alper D, Gurses H. Chronic effects of welding exposure on pulmonary function tests and respiratory symptoms. Occup Environ Med 1995;52:800-3. 12. Chinn DJ, Cotes JE, El Gamal FM, Wollaston JF. Respiratory health of young shipyard welders and other tradesmen studied cross sectionally and longitudinally. Occup Environ Med 1995;55:33-42. 13. Chinn DJ, Stevenson IC, Cotes JE. Longitudinal respiratory survey of shipyard workers: Effects of trade and atopic status. Br J Ind Med 1990;47:83-90. 14. Jayawardana P, Abeysena C. Respiratory health of welders in a container yard, Sri Lanka. Occup Med 2009;59:226-9. 15. Ekici A, Bilgili Y, Ekici M, Unal B, Akin A, Erdal H, et al. High-resolution computed tomography findings in Arc-welders. Turkish Res J 2006;7:52-5. 16. McMillan GH, Pethybridge RJ. A Clinical, Radiological and Pulmonary Function Case-control Study of 135 Dockyard Welders aged 45 years and over. J Soc Occup Med 1984;34:3-23. 17. McMillan GH. Studies of the Health of Welders in Naval Dockyards. Ann Occup Hyg 1979;21:377-92. 18. World Health Organisation. Guidelines for controlling and monitoring the tobacco epidemic. Geneva; WHO; 1998. p. 76-101. 19. Centres for Disease Control and prevention, National Institute of Occupational Safety and Health, US. NIOSH Spirometry Training Guide, 2004. Available from: http://www.cdc.gov/niosh/docs/2004-154c/[Last accessed on 2011 Jan 01]. 20. Cotes JE, Feinmann EL, Male VJ, Rennie FS, Whickham CA. Respiratory symptoms and impairment in shipyard welders and caulker burners. Br J Ind Med 1989;46:292-301. 21. McMillan GH. The Health of Welders in Naval Dockyards: Welding, Tobacco Smoking and Absence attributed to Respiratory Diseases. J Soc Occup Med 1981;31:112-8.